Up-front-ish-ness-ness: If Shakespeare could make up words, then… (analogy fail). I may have received a free laptop from Staples in exchange for an honest, sassy review. My husband will assure you I’m an expert at being honest and sassy. I thought I had things under control this year. I bought school supplies slightly earlier than the night before Vivian and William were to start Grade 4. I didn’t have to pull an all-nighter labelling said school supplies. For the first year ever, I didn’t buy the wrong notebooks or scrapbooks. On Tuesday night, I scrolled through my Facebook feed. Post after post of back-to-school photos. I didn’t take a picture of my twins. In fact, I can’t even remember the last time I took a picture of my twins. Thankfully, though, Vivian and William can now take 8000 pictures a day of themselves. This little cutie (it kind of looks like a baby MacBook Air) weighs about the same as three of my toes. It is fast and zippy, kind of like a kid on a sugar high. Thankfully, I’m a Google user, so adapting to the Chrome interface (or whatchamacallit) was easy. My kids, of course, figured it out even faster. I was a bit freaked out about the lack of software I was familiar with. No Microsoft Word, no Pages, no iPhoto. But you know what? Within five minutes, I’d downloaded a great word processing program for free at the Google App Store. I’d also found photo editing software that’s more comprehensive that PhotoBooth, so my daughter can turn me into FrankenMom in three short steps. 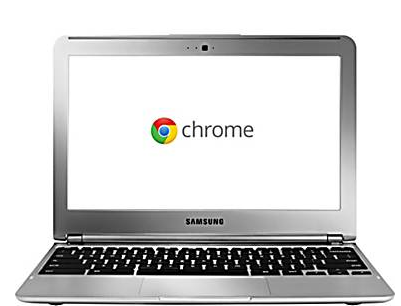 Now we all fight over the least expensive and newest bit of technology in our house, the Samsung Chromebook. It retails at Staples (in Canada) for $269.96. It’s cheaper in the US, but y’all have healthcare issues you have to pay for, so I guess that’s fair. Seeing Vivian and William play with their first computer reminds me of my own: a 286 that weighed as much as a dozen Sumo wrestlers. It was complete with a 9-pin dot matrix printer. Nothing reminds me of university like the screech of that puppy at 3 AM and the person below me pounding on his ceiling with a broom, trying to tell me to stop printing my 20-page paper. Oh, the joys of technology, circa 1990. What’s your favourite piece of technology recently? We had an Apple IIc then an Apple IIe when I was a kid. I KNOW. Now I have an hp, but I’m starting to think about replacing it. The kids have cheap Acer laptops which they hate, but I think it’s more a user issue than anything else. The Apple IIc was the BEST! I was envious of the Apple crowd! Sorry for the surprise. I put a rambling preamble up now so other readers aren’t shocked. Happy Fried-Day! I have what I call a “boomerang” iPod. I grab it, use it, it breaks, and I send it back (again and again) to get fixed. Ha. Love how you named it… At least it comes back! My most recent favorite piece of technology has to be my Kindle Fire because my 4 y/o niece Mackenzie is really starting to get into reading after I uploaded several interactive books just for her. I couldn’t begin to tell you what my first pc was….an abacus board? Does that count? Lol! I kind of missed the interactive books with my kids. I guess it’s not too late. I love aunties and uncles who do that sort of things for their nieces and nephews. I am a hands on aunt because it fascinates me to see her grow and learn, and I want to be part of the village that raises her. Hope your comment doesn’t make you think your healthcare is free. I wonder what percentage of the taxes paid by Canadians goes to pay for the “free” healthcare. True. We do have high taxes! But years of living overseas and the stress of “will our private insurance plan cover this?” have made me very thankful. You have me beat. My first computer was a 386. You can get Word on that Chromebook by using office365. I’ve not been a fan of MS Office products, but Office365 is a cool piece of kit. That’s funny! I was given a Samsung Chromebook just like yours for my wedding present. I love it! Did the pastor just try to call you out? Is that what that was? You likely have more $ in the bank than the rest of us. We had the “original” MAC that required you to insert the hard disk yourself. And if it gave us any grief, a paperclip did the trick. I have a chrome book and love it! It does everything I need it to do! You’ve arrived, young lady. Well done! My first computer was a Commodore 64, the one where you had to type in the code for the game before you could play it. It was fantastic, I suddenly miss it tremendously. I also just finished your book and loved every word of it. Favorite piece: KitchenAid Mixer – let’s see an an iPhone make brownies!!! First computer: let’s just say cards, punch tape and phone cradles were involved. The dot matrix printer, you rarely ran out of ink. Tell them I’ll write about it in Australia if they give me four. No wait – make that five, hubs better have one too. My first computer? Might have been a 286 too I think. I remember dot matrix printers too, but then I remember bookkeeping machines! Latest gadget? My Samsung phone but I am hoping my next will be a fancy new Nokia. Work provide my laptop and phone so I don’t get a lot of choice! My Ipad. The original model! You know, the one that weighs the same as basket of toes. …and where exactly would you find a basket of toes? and what scenario would you be dealing with? My guess is that you would want to leave the area quickly.